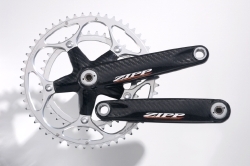 ZIPP Speed Weaponry has all lengths of its Model ZIPP 300 Carbon Fiber Cranks available for immediate delivery. The ZIPP 300 cranks in 170, 172.5 and 175mm are in stock now after months of final "tweaking" to get this product just perfect. As a special promotion, the ZIPP 300 cranks come with a ZIPP 185 Bottom Bracket for $50 off of suggested retail. Now get the model ZIPP 300 cranks set in a special tin package with the ZIPP 185 BB for the combo price of $900. The heart of the ZIPP 300 crank set is a revolutionary bonding process with allows the carbon fiber to bond to the aluminum with a strength similar to that which it bonds to itself. This process is so specialized and sensitive that it is thus far available only from 3 aerospace suppliers. The process increases bond strength by more than 3x when compared to traditionally employed methods. This special bonding process allows the ZIPP 300 to use more than 200 grams less aluminum that other designs, allowing designers to utilize nearly 80 grams of additional carbon fiber in order to increase strength and stiffness resulting in a crank that is truly supreme in terms of stiffness and durability. ZIPP also had to search for an alloy that is as strong as 7074, but with significantly higher fatigue properties. As a result, ZIPP discovered 2XXX aluminum from Alcoa. This aluminum was developed as a replacement to 2024 in military aircraft and allows for the further removal of weight due to its significantly higher fatigue strength. In fact, the ZIPP 300 crank sets have achieved more than 3.5 million cycles at 300 lbs (1500N) without crack initiation or failure in the bond line. The ZIPP 300 Carbon Cranks set is 20% lighter than the next lightest, and exhibits 50% higher stiffness than anything previously available so all your power hits the road. The ZIPP 185 BB is the result of years of research into making a better BB, and after careful work with our bearing supplier, ZIPP has created the ultimate ISIS compatible Bottom Bracket. The ZIPP 185 BB uses 6AI/4V titanium to create a super light spindle which rides inside two twin-row bearings. The spindle is then TiCN coated to stop galvanic corrosion while the bearings are a whopping 14mm wide compared with 12mm for standard double row bearings. This means the ZIPP bearings better distribute forces for a reduced ball load and add considerable bending stiffness to the spindle. These ZIPP ultra-precision were designed and manufactured specifically for ZIPP in Germany to the highest standards and use custom formulated waterproof great to ensure that your BB will roll at smoothly at mile 10 as it does at mile 10,000.